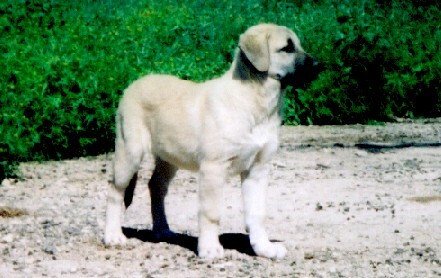 Knowing that our Great Pyrenees are getting pretty old, I picked up this Anatolian Shepherd as a pup in March 2005. We named her Honey, but she is far from sweet. This is a dog who takes her guarding seriously, and has to be the boss. On one occasion she got in with our Pyrenees when the goats knocked down a panel, and tore all of them up plus Max our Australian Shepherd who was in the pen with them! In addition to other dogs she hates; porcupines, cats, deer, turkeys, black birds, buzzards, beavers, nutria, racoons lizards, and basically anything else that moves with the exception of goats and her owners. She is a very smart dog. On one occasion I turned the water off to the trough in her pen and forgot to turn it back on, after a few days she and the goats ran out of water. She jumped the fence (which she never does), got a drink from the river, then ran up the hill to get our attention. I followed her back to the pen, and soon figured out why she had jumped out. Lately, we have assigned her to guard the bucks since she won't play nice with the other dogs. The bucks follow her around like they would be lost without her. She takes them to and from the bedding, feeding, and watering areas, and never leaves them. 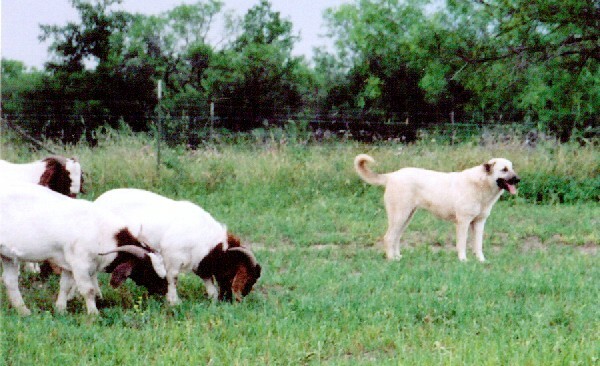 The photo below is of Honey and part of "her" buck herd.